In the late summer of 1914, the noted English diplomat Sir Edward Grey was quoted as saying; “The lamps are going out all over Europe, we shall not see them lit again in our lifetime”. The event of which he spoke was the declaration of war amongst the major powers of Europe, precipitating the First World War. What was meant by this statement was that the ruling houses of the major monarchal powers would not survive the onslaught of both modern warfare and modern political reforms that were about to sweep over a war torn and decimated Europe. The Hapsburgs, Hohenzollerns and the Romanovs had ruled their individual nations autocratically for centuries, but with the entangling alliances that were formed after the Franco-Prussian war of 1870, each would be drawn into the escalating conflict that would bring about an end to their respective dynasties. 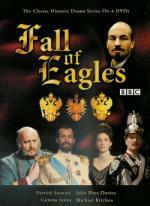 It is upon these entangling alliances that the BBC mini-series Fall of Eagles is based. Starting with the inter-connecting marriages between most of the ruling houses of Europe and the offspring of Queen Victoria of England, roughly 75 years of monarchal mischief, mayhem and malevolence are showcased in 13 episodes, ending with the abdications of the aforementioned rulers prior to the signing of the Treaty of Versailles in 1918. I had viewed a few of the latter episodes of this mini-series on the Bravo network back in the late nineties, and had been drawn into the drama of these doomed despots and eagerly awaited a release on DVD. Now after viewing the series as a whole, I must admit that while it is entertaining, it also comes across as more of a soap opera than an in-depth treatise on the events which brought about the beginning of the war. Much time and many episodes are spent on trivial palace melodrama and political intrigue amongst all of the ruling houses. This leaves the mini-series a little bit flat on excitement and makes one wonder why the story needed to spread out over thirteen episodes. Another point of contention for me was the fact that many of the main characters suddenly disappear and their fate and destinies are brushed over quite insignificantly. Which leads me to wonder if this is the complete story in this DVD package? I could have sworn that one of the episodes that I watched on Bravo, dealt with the execution of the Romanov family during the Russian Revolution of 1917. My memory tells me that there was a scene of the family being herded into a small room and a few of the Bolsheviks walk in and suddenly open fire upon them. I could bring wrong and my memory could be failing me, but I also vaguely remember more interaction between the Kaiser and his two main generals, Otto von Bismarck and Erich Ludendorff, concerning the disposition of the war. All in all, if you were a fan of the two brilliant BBC productions Upstairs, Downstairs or I, Claudius, then this mini-series will probably satisfy. But if you are even the slightest bit knowledgeable about the events that this drama is based upon or can’t bear the thought of Russians, Germans, Austrians and Frenchmen speaking with thick British accents, then this may not be your cup of tea.